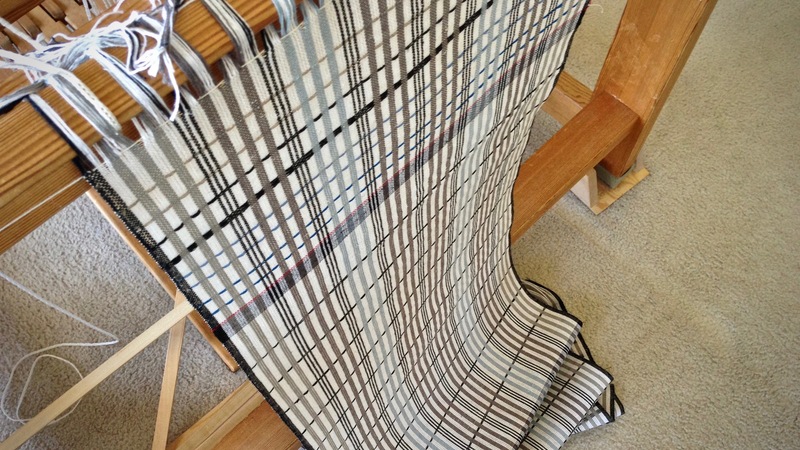 The end of the warp is a fantastic way to try out ideas for future weaving projects. I have some kid mohair/silk yarn on my shelf in blue, lavender, and tan. 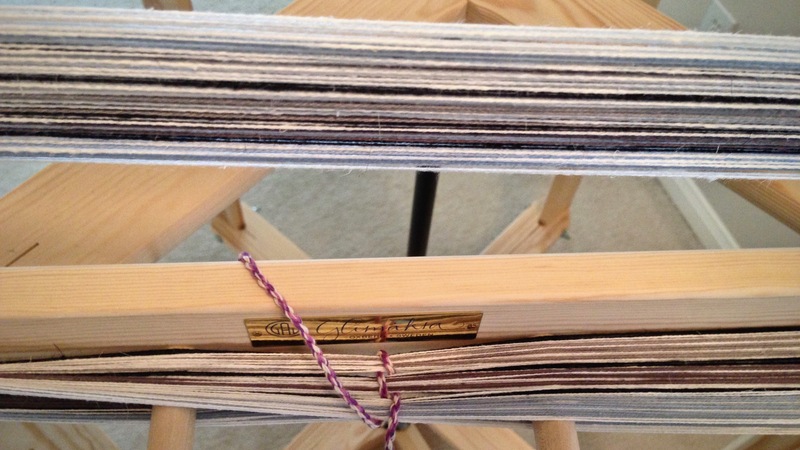 I wove some pretty shawls with this angelic yarn a few years ago on my rigid heddle loom. 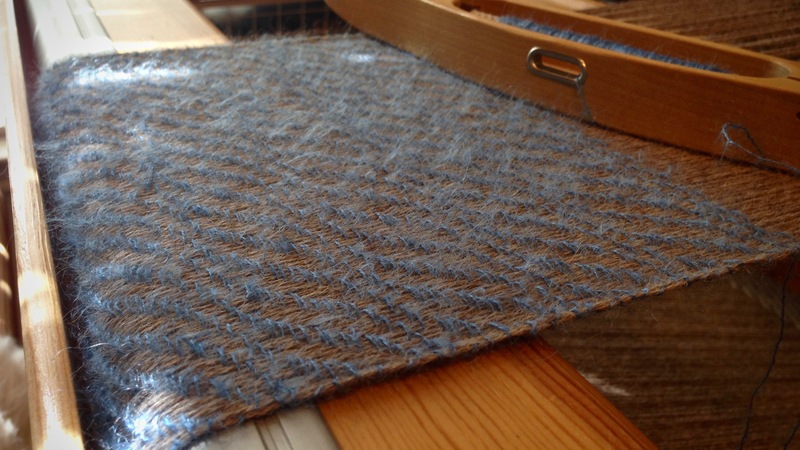 Hmm… would kid mohair/silk work as weft on the alpaca warp? This is a good way to learn. If it works, I know I can do it again, but on a larger scale. If it doesn’t work, I know what to avoid. The point is to learn. As handweavers, we learn by doing. And in daily life, we learn by doing–walking in this manner or that. We do not walk alone. The Lord stands ready to teach every inquiring soul. My prayer is, “Lord, teach me; help me understand; help me walk.” Sometimes what we learn surprises us. 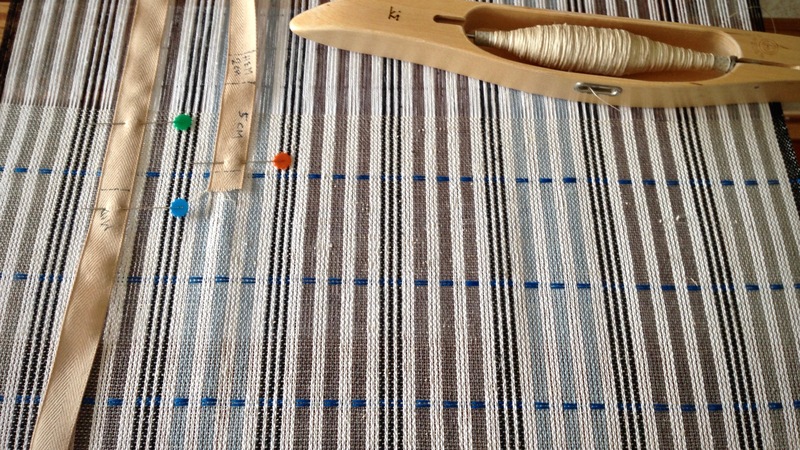 The trial weft may be even better than the one we originally planned. May you enjoy lifelong learning. Yes, life long learning. The path is pleasant. Hi Carolyn, Thank you for your thoughtful words. Learning is one of the best paths in life. 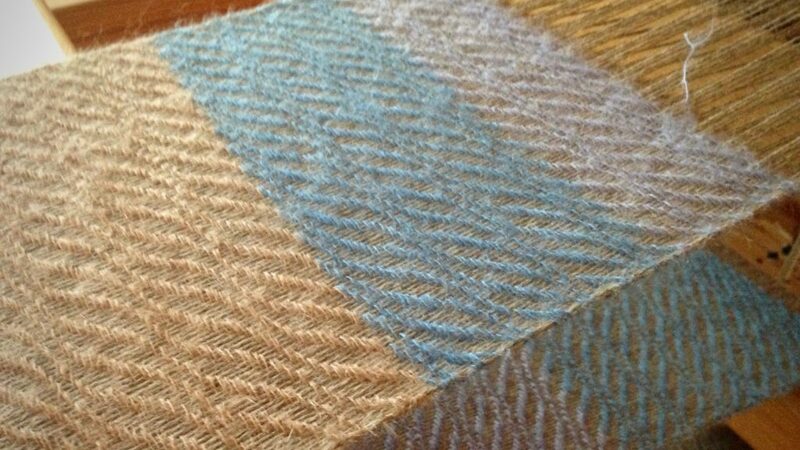 This is a very beautuful way to use mohair-silk as weft. Just wondering what the sett is for this pattern and where you found the draft? I have some kid mohair-silk yarn that is intended as knitting yarn but I would prefer to use it in weaving – I have a poncho in mind- and I am looking for a suitable draft that I could use or adapt. Thank you for sharing this very lovely project, it is most inspiring. Hi Chris, The kid mohair-silk is dreamy yarn. I used a draft from “The Big Book of Weaving,” by Laila Lundell, p. 116. The warp was 3-ply alpaca yarn. I used a 30/10 metric reed (equivalent to 7.6 Imperial), and the sett was 6 epc, or about 15 epi. Thank you very much for sharing this. I will check it out, the book you mention is in our Guild library. The joy of weaving is a blessing, as is the joy of friendships across the miles. Thank you for walking this journey with me. Thanksgiving prayer: Thank you, Lord, for everything. May you overflow with blessings and reasons for giving thanks. These towels are just beautiful. Thank you for all the work you do to help us with our weaving. Happy Thanksgiving my friend! Hi Liberty, Everything is more enjoyable with friends! Thanks for your sweet encouragement. Love the photo of the towels rolled up- very interesting to view. Beautiful work as always. Hi Martha, The linen is predominant in these towels, and linen begs to be rolled. I had fun playing around with them to take pictures. I will definitely be interested win the kit! Beautiful! Hi Anne, I’m glad to hear that you are interested in the kit. Thanks for letting me know! The towels are lovely. I too will be watching out for kit information. I’m wondering if hemp would be worth a whirl in place of linen? Hi Theresa, I’m excited about putting the kit together. It’s good to know you are keeping an eye on it. I have never woven with hemp. From what I’ve heard, it weaves much like linen. So I’m certain it would work for this. I love the Bockens and the Borgs Swedish linen, so I haven’t branched out much in that regard. Hi Christine, Thank you so much! If you’re interested, there are a couple of these towels in my Etsy shop, as well as “Workshop in a Box” kits, where you can weave these towels for yourself. The end is near. I can see the end of the pre-measured tape. These two long scarves could be named “too long” scarves. The repeating pattern of this eight-shaft twill is very…repetitive. And the color is very…monotone. Soft and warm, they will certainly be beautiful scarves…eventually. Can you tell I am ready to be finished? 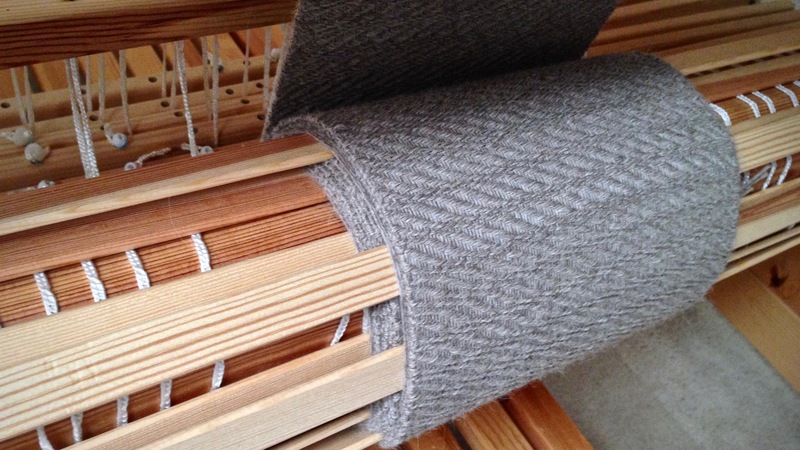 Soft 3-ply alpaca yarn is used for the warp and the weft. The end is in sight! I don’t always have patience. I want things to hurry up; I want to be finished now. And I don’t want trouble along the way. Obstacles make me lose my patience; and my attitude becomes unattractive. As much as I try to stay positive, the negative thoughts can get the best of me. When we’re at our worst we need kindness the most. Kindness changes us. Kindness reminds us to look at what is being woven. Woven fabric forms layers around the cloth beam. 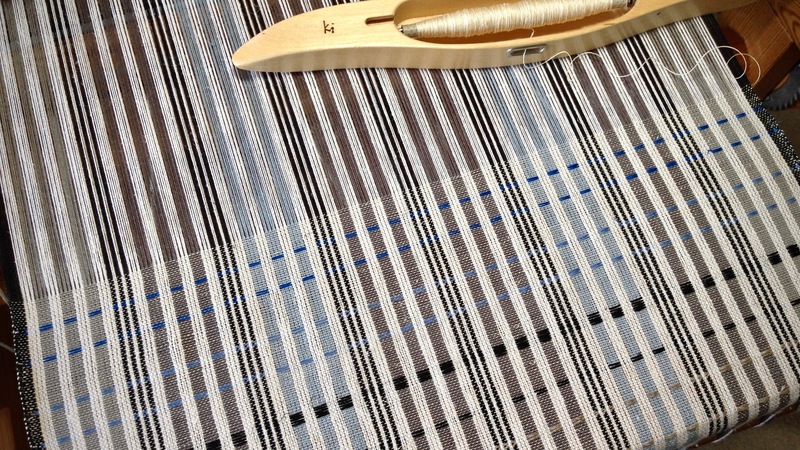 Warping slats are added at the cloth beam between the scarves to keep the unwoven yarn (for fringe) from slipping off the cloth layers at the sides. We all need and desire kindness, even when we don’t deserve it. Grace is pure kindness toward the unworthy. God gives great grace. He takes an unworthy subject like me and pours on kindness. In that grace I find the patience I need for today. Oh, how lovely that scarf will be! May you give and receive generous amounts of kindness. These scarves are beautiful. Your selvages are impressive. I can almost feel the softness of these alpaca scarves. Lovely, lovely work. I’m curious to know how you do these hem stitching. I need to go back and look through your tutorials. 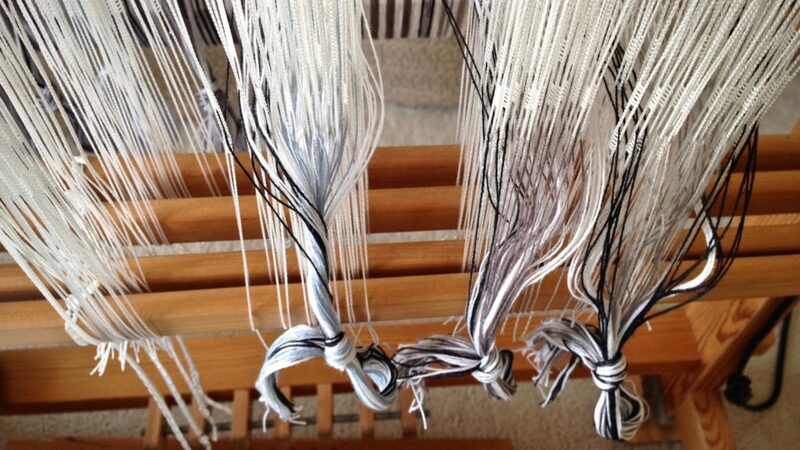 I’m not a new weaver but an inexperienced one for sure and I’m very much enjoying your blog. Good morning, Cate, It’s a pleasure to meet you. The alpaca yarn is great to work with, and it seems like it just falls into place at the selvedges. I have not done hem stitching on these scarves because I am going to tie a lattice fringe, and I didn’t want a hem-stitched border. When I take these off the loom I will need to be very, very careful to keep from disturbing the wefts at the ends of the scarves. I do have a tutorial on hem stitching at this link: Bold Hemstitching. Very ice they will be, but i know what you mean about repetition . Hi Fran, Its good to have someone who understands. The repetition does eventually come to an end. I finished the second scarf last night. Now, I’m playing with other yarns until I get to the end of the warp. Beautiful Karen! I love that pattern. Santa is coming early for me this year (tomorrow) my sweet husband got me a 8 shaft Baby Wolf! I’m so excited! Can’t wait to get going on it and try some new patterns! Hi Liberty, I’m excited for you! You are entering some new adventures. I’m sure you’re already planning your first projects! Interested in the packing on the cloth beam….if you were not having fringe on the scarves and were weaving the entire warp, would you pack the cloth beam? Have you used this technique (there are many different sumac designs) as an edge on any scarf, blanket, etc.? 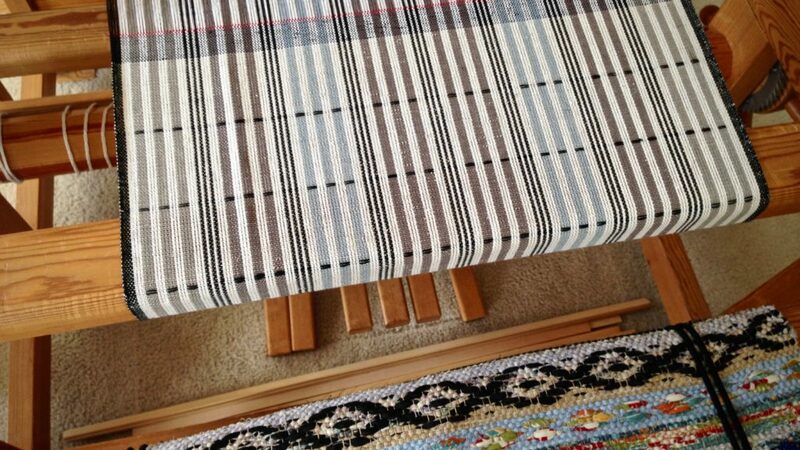 Louise, I do put warping slats on the cloth beam for the first turn of fabric around the beam. 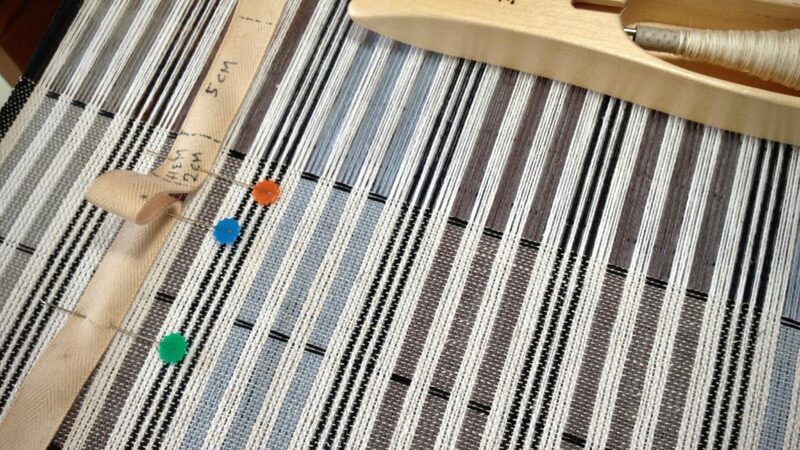 After that, if I didn’t have the unwoven warp, I would not have added more slats. I am not familiar with sumac being used in this way- as an edge on fabric. I only have a very small acquaintance with sumac as a tapestry technique, but I don’t know it well enough to use it very often. If you have more information about this topic, I’d love to see some resources to learn more. Have also used this technique in tapestry many decades ago. Van Nostrand Reinhold Publishing, NY were the original publishers. Apparently the title was purchased by Interweave Press, 1982. 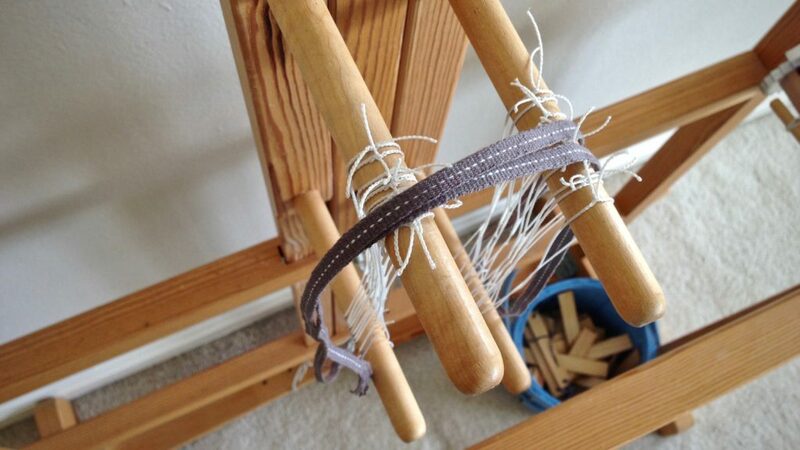 I am in the process of putting a narrow cotton scarf warp on the loom and doing Soumak in place of hemstitching. Will report later. Wonderful! I look forward to seeing what you do with it. Thanks for the resource! I have a digital camera and can send photos via email. How do I send you a photo? You can send emails to karen at warpedforgood dot com. I shared your post to my FB page and said “One of my favorite blogs that I follow. Karen is a jewel that sparkles even on a dark cold winter day <3 "
Good morning, Margaret, You have touched my heart more than you know. I appreciate you! I was ready to hem the plattväv towels. 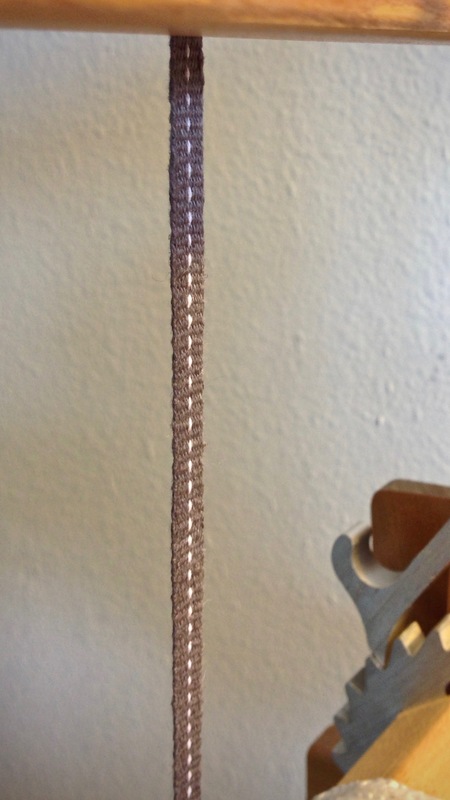 But then, I thought of one more thing–I need a woven band for the hanging tabs! Since the towels have black borders, I decided to weave a simple band in black cottolin, with a single white dotted line down the center. 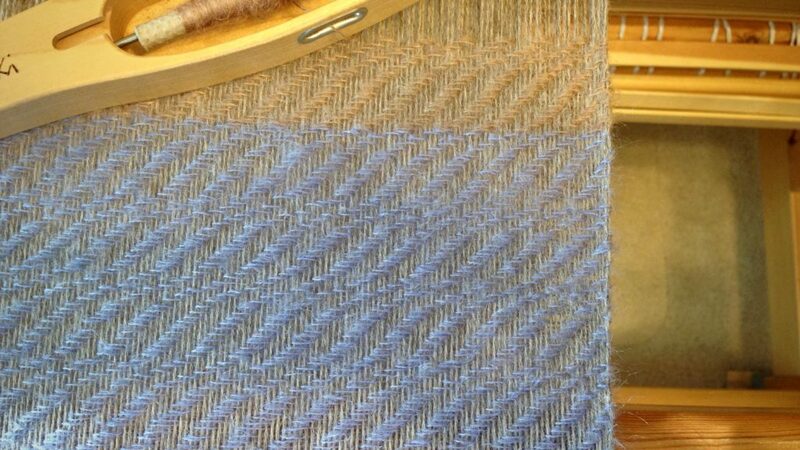 I measured the little warp, put it on the band loom, and quickly wove it up. 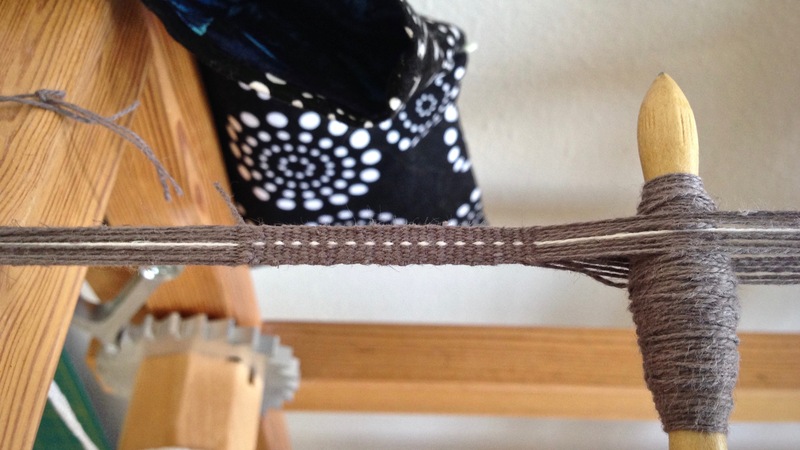 Single white thread produces dotted white line in the woven band. I love the classy black band with the white dotted line. However, I don’t love it with these towels… Too wide, and too… black. It’s going into my band stash box. Someday, when I least expect it, I’ll find this band in the box; and it will be exactly what I need at the time. So, I started over at the band loom this morning, and wove a new band. 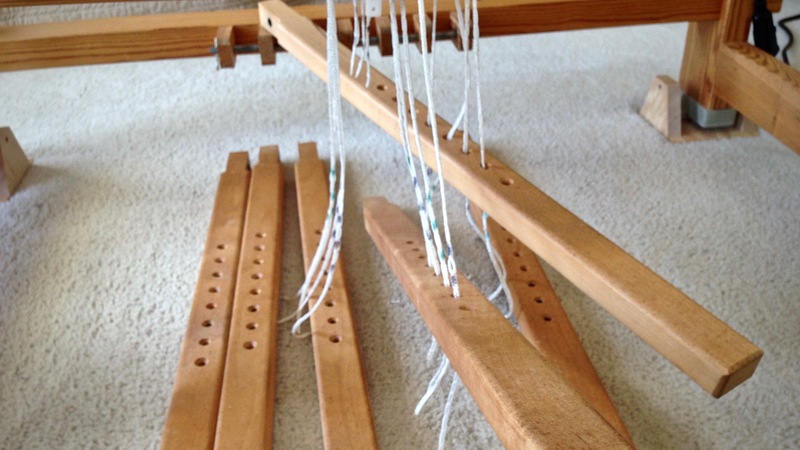 Second chances are possible with a Glimåkra two-treadle band loom. It doesn’t take long to weave a second band if the first one doesn’t work out. Ready to be cut into hanging tabs for the plattväv towels. 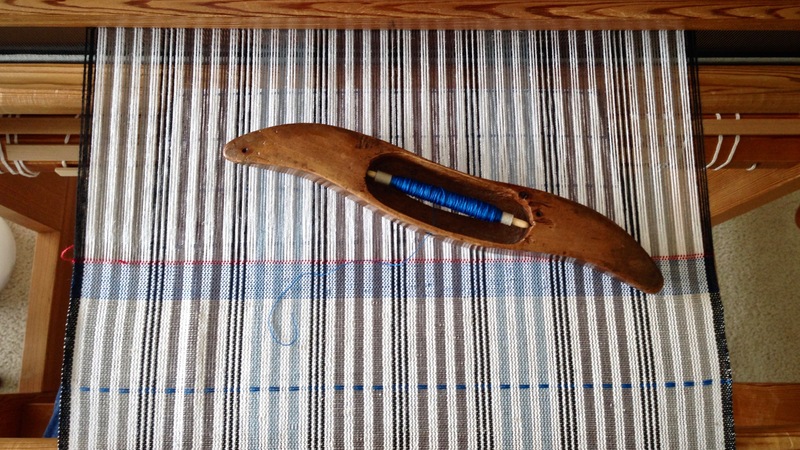 Hem, turned twice to the back of the towel, is pressed and ready to be stitched. The ends of a coordinating hanging tab will be stitched in the seam. The black woven band is stashed away for future use. The narrower gray band fits the style of the towels. Joy is ignited by giving thanks. Gratitude changes your outlook. Instead of seeing the black band as a setback, it’s a gift for the future. The gray band is a reminder to be thankful for second chances. To whom will we give our thanks? To our looms? No. To each other? Yes. And to our Maker who gave himself for us? A resounding, joyful yes. May you continuously be thankful. Hi Ellen, I never would have thought of that! That’s very interesting and good to know. I’ve seen some towels with the tab on the side – maybe that would help with the wear, too. Hi Ruth, I like to hem my towels with the sewing machine. To me, that seems the most reliable way for the hems to stay in place through years and years of washings. I did hem the table square (not shown) by hand. I don’t expect it to go through many washings, and I wanted the hem stitches to be invisible. I love the look of hand-hemmed towels, and the craftsmanship it shows. 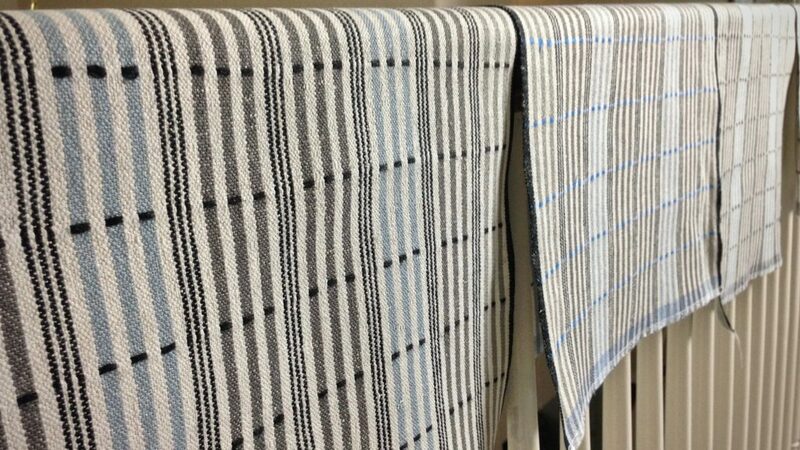 And I have friends who always hand hem their handwoven towels. I admire them for it. Could you post a photo of your whole band loom, with heddles and maybe a warp with something to show its relative size? I have a couple of looms for bands, one very antique and the other an inkle, but neither seems as quick and easy as yours seems to be. I’m really impressed that you didn’t just “make do” with the black; certainly the grey is an improvement and perfect. Will be interested in your answers to the other questions also. 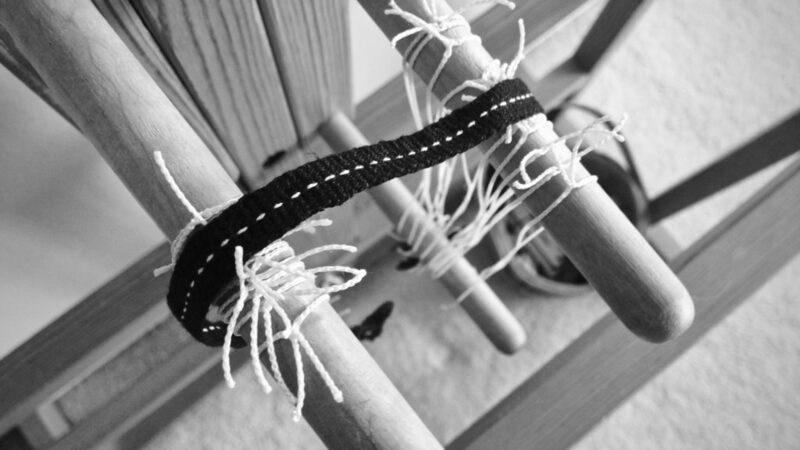 N.
Hi, Nanette, You can see pictures of the whole band loom, and a video that shows how I weave on the band loom at this link: Quiet Friday: Band Loom Warping and Weaving. I certainly did have a dialogue with myself about “making do.” The perfectionist in me won the discussion. Your “perfectionism” will be my goal! N.
Curious about the bobbin/shuttle you’re using with the band loom. Where do you get them? Hi Sherri, My husband made the band shuttle for me. A cardboard quill, cut to a small size, works as well. 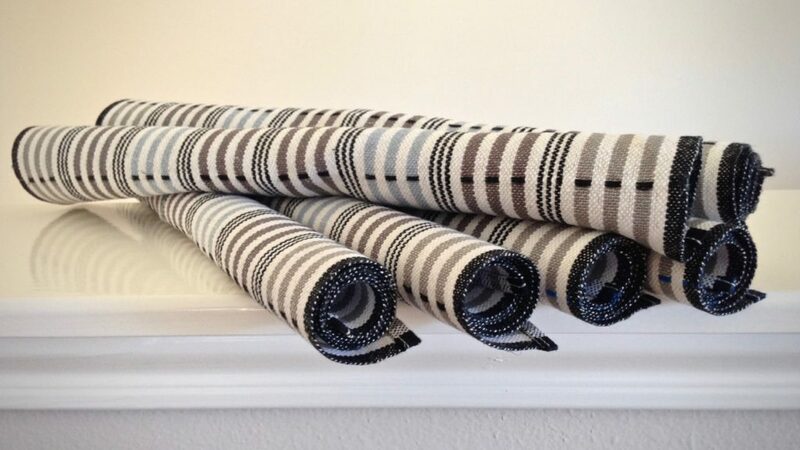 The length of woven cloth unrolls and unrolls until you get all the way back to the front tie-on bar. The towels are 70% linen. Oh, how I wish you could touch this fabric! You would feel the crispness of a linen tea towel, with a little bit of cotton softness. 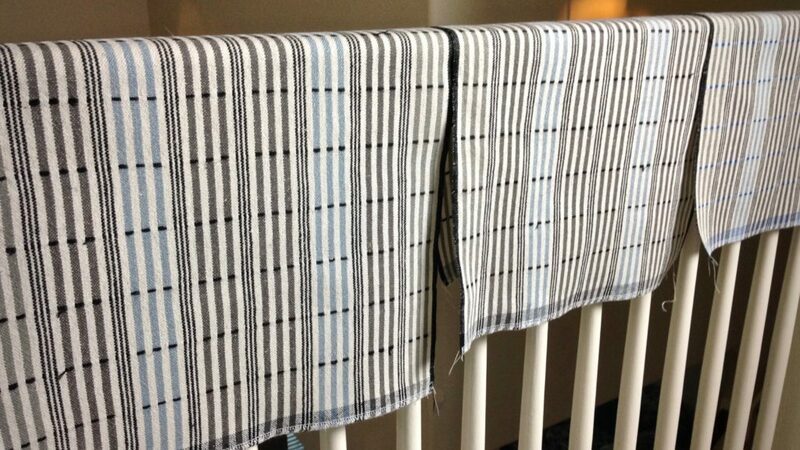 Plattväv towels and one table square are unrolled from the loom. Last to come through are the warp end knots securely hugging the front tie-on bar. It all comes back to the front tie-on bar. This is where the weaving begins. The warp ends must be secure at the beginning. 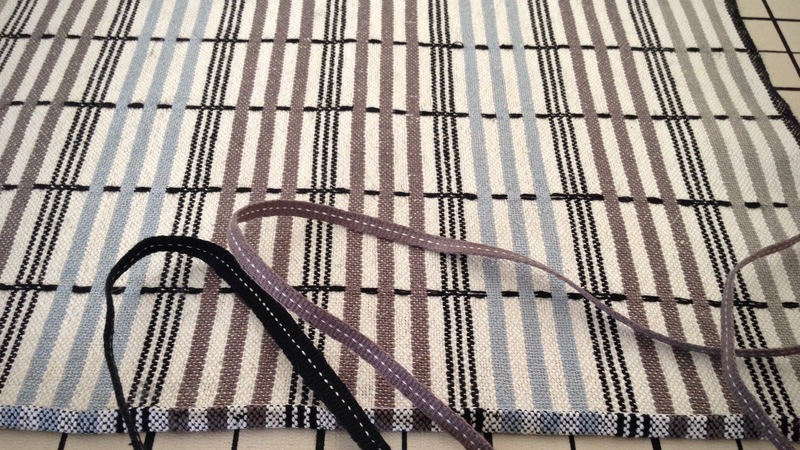 No one wants the tie-on knots to slip as the woven fabric rounds the cloth beam. You want warp ends to be securely fastened, with no chance of losing their grip. Your cloth depends on it. 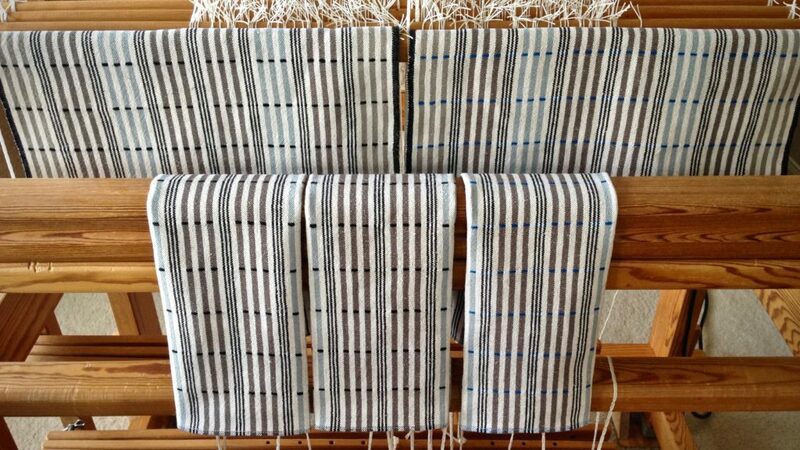 Plattväv towels, with 22/2 cottolin warp, and 16/1 linen weft. The towels have been washed, dried, and pressed. 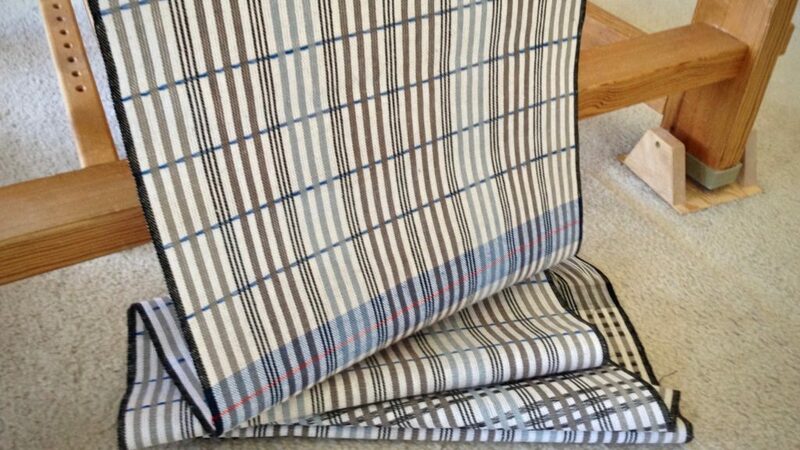 They are ready to be hemmed. Think of yourself gripping onto hope. Think of the knots that hold tightly to the front tie-on bar. 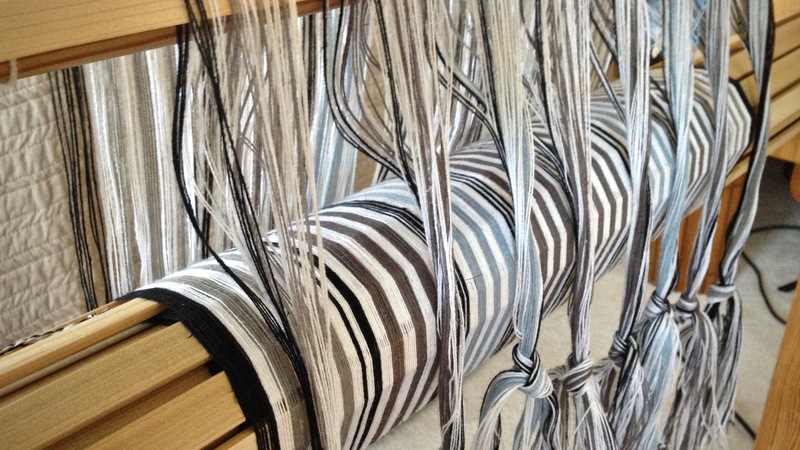 Hold tightly to hope, and don’t let go while the weaving progresses. Our hope is not some vague wish. Our hope is based on the redeeming work of Jesus Christ–God’s promise to be with us. God can be trusted to keep his promise. Don’t waver in your tight grip on this true hope. 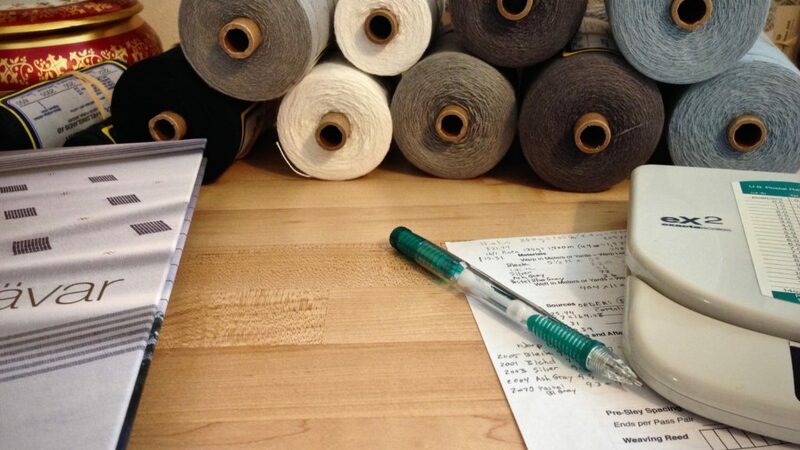 The fabric of your life depends on it. May you be known for hope. just wanted to let you know how much I appreciate your news letter and the Bible connection you share with us. Hi Carol, I write what is in my heart. I’m fortunate to have you to share my thoughts with. Love the new towels, I appreciate all the weaving tips you share and the chance to view your work. Hi Martha, It’s a delight for me to have a way to share what I learn. Thanks for being here! I love these towels – colors, fiber and draft. Hi Cindie, I’m glad to hear that! They are a delight to weave, too. 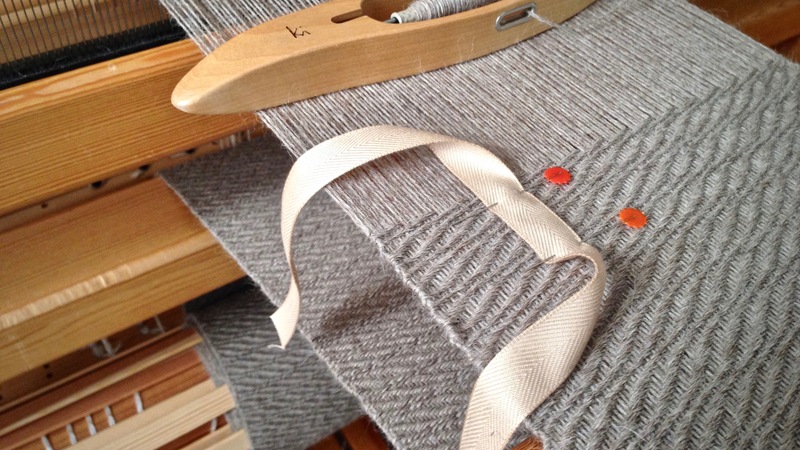 I especially love the linen weft–that’s takes them up a level, in my view. Thanks for your very kind words, Debbie. What a beautiful statement – “weaving in the threads of our craft with the threads of our faith.” Aptly said. The towels turned out beautifully, Karen! Wonderful work as always. Thank you, D’Anne! I’m happy with the way they turned out. Now, I just need to add some band-woven pieces for hanging tabs. How sweet of you, Karen, to chime in with such kind words. It makes me very happy to think of you being touched with peace.